Medieval economics are fiendishly complicated. Rather than a modern liquid cash economy, medieval economics relied on debt, transfers, obligations, accounts, and direct trades. It might be possible to build a system that could handle it, but OSR games love cash economies. If your XP is linked to the treasure you loot, it only seems fair to give you things to spend your treasure on without significant inconveniences. This post is for people who want to include feudalism in their games but don't want to include excessive detail, extra stats, or endless math and tedious domain management that seems more suited to a video game than an RPG. The only safe investment in troubled times is land. Land can't be stolen easily. It is resistant to most disasters. If you want to invest on a generational scale, invest in land. You don't know. Nobody knows. Surveying now, with the use of GPS, lasers, tape measures, and a universal measurement system is still relatively tricky. Surveying without these tools, in a world where a "league" meant something different between towns, when multiplication required roman numerals (and didn't use the cheat-like step of converting them into arabic numerals and converting them back), when boundaries were set by custom and not by fences... measuring land was next to impossible. The Barony maps in this post look nice and neat. You could calculate the approximate area of a given barony in six-mile hexes... right? More or less. But on the next level down, on the level of individual manors and farms, using a map no longer makes sense. It is far easier to work in abstract terms. The PCs own a farm somewhere in a given hex. And a 6-mile hex is big. If you use my fast mapping system, you should have a clear idea of which areas are Core, Developed, Undeveloped, or Mountain/Wasteland regions. If you are using another mapping system, decide which areas fit these labels. Currency uses my system. 1 gp = 10sp = 100cp. $1 modern American dollar = 1cp = 1 denier for the purposes of estimation. Revenue estimates are based on this book. In order to figure out baronial revenue, we need to figure out towns and cities in the barony. We might as well figure out the population at the same time, although you could easily skip this step with no impact on your game whatsoever. Some fuzzy math and Fermi estimates have been used to keep the math nice and tidy. If you want precision, look elsewhere. Numbers adapted from this post. To compare to modern values, start here. The Base Agricultural Population of each hex is listed in the table below. This number is fairly fuzzy. It covers extra people living in cities and towns, villages too small to name, vagabonds, army encampments, and rounding errors. Cities are small. The greatest cities in the world might boast 200,000 people. Most contain about 10,000 people. 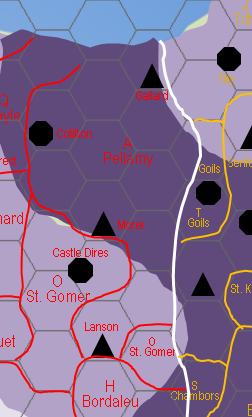 Each Core region (not hex, region) might have one city (black octagons). The black octagons can also represent large castles or fortified towns. Scatter other cities around as needed. There's no hard and fast rule about where cities should be located, except that they should not be located in Undeveloped areas without a very good reason. All regions will have at least a few towns (black triangles or black octagons that are not cities). Smaller still. 200 people at most. Village size varies considerably, so you could have a village of 10 people or even 1 lone farmer in the ruins of a deserted or plague-wracked ruin. The Base Agricultural Population includes everyone living in villages too small to have anything of interest to adventurers. So you can now total up the population of a given Barony. About 2 hexes total: 1 Developed Hex and 1 Undeveloped Hex. One black octagon, but it isn't a city (Elderstone, nearby, is a city), so it's a Town. The total population is: 900+300 (Base Agricultural Population) + 2,500 (Town) + 2,000+600 (Villages) = 6,300 people in the Barony. The average population density is ~100 people / square mile. The Barony contains 1 town, 13 villages of note, and not much else. About 7 hexes total. All Undeveloped Hexes. One black octagon and 2 black triangles. All are Towns, although the black octagon's town lives in the shadow of a castle. The total population is: 7x300 (Base Agricultural Population) + 3x2,500 (Towns) + 7x600 (Villages) = 13,800 people in the Barony. The average population density is ~60 people / square mile. The population is clustered around the non-forested areas and the coast. About 9 hexes, all Core. 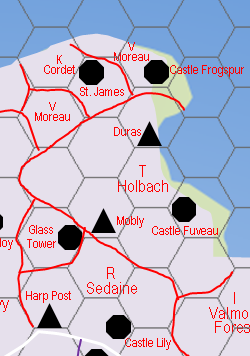 One black octagon (City) and two black triangles (Towns). The total population is: 9x2,500 (Base Agricultural Population) + 10,000 (City) + 2x2,500 (Towns) + 9x2,000 (villages) = 55,500 people in the Barony. The average population density is ~200 people / square mile. The values here are calculated post-tax, post-tithes, and post-conversion expenses. Much larger amounts are actually paid, but accountants, taxes to overlord, ransoms, and paying accountants take off a considerable sum. This is, effectively, the liquid cash a baron is able to spend freely. They still need to pay their monthly upkeep. About 2 hexes total: 1 Developed Hex and 1 Undeveloped Hex. 1 Town. Total revenue is 100gp per month, 1,200gp per year. As a minor Baron, the Baron of Leroux needs to spend 72gp per month just to maintain his status, so his actual discretionary income is a mere 28gp per month. About 7 hexes total. All Undeveloped Hexes. 3 Towns. Total revenue is 270gp per month, 3,240gp per year. As a medium Baron, the Baron of Holback needs to spend 84 gp per month just to maintain his status. His actual discretionary income is a very nice 186 gp / month. Given the isolation and strategic position of his Barony, he probably spends it on defense and castle-building. About 9 hexes, all Core. 1 City, 2 Towns. Total revenue is a staggering 790gp per month or 9,480gp per year. Pellamy is owned by a Count, who must pay 120gp per month in expenses to maintain his court. His actual discretionary income is barely affected, at 670gp per month. For the purposes of this estimation, Counts and Dukes have a revenue equal to their core barony, plus a set amount from each hex in their County or Duchy (outside of any baronies they own), and without any baronies that are owned by the Church or the King directly. The County of Pellamy has Baronies Pellamy (790gp per month, 9,480gp per year) the Glass Tower (1 Undeveloped hex, 1 Town, 50gp per month, 600gp per year) , and Vise (1 Core, 2 Undeveloped hexes, 1 Town, 355gp per month, 1,065gp per year). 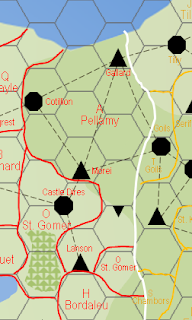 There are 2 Core and 18 other Developed hexes in the County (outside of Baronies in the Count's control) which bring in a total of 11gp per month or 132gp per year. The Count of Pellamy therefore commands the princely sum of 1,195gp per month or 14,340gp per year. The PCs might one day aspire to a Barony or even a County of their own. They are far more likely to start on the lower order of society. Income is listed after taxes and tithes. The "Cost to Buy" is how much you would need to spend to purchase the land outright. This almost never happens; land is inherited, transferred, gifted, or stolen through legal chicanery, but very rarely sold. It's much more sensible for players to acquire land through grants and gifts instead of outright cash. The GM or the PCs can describe their farm in detail, adding pigs, fences, surly tenants, good wells, and stone paths as needed. One hut, a small vegetable patch, a few strips in the fields, and a share everything the community owns, does, or thinks. Income: 0. You won't starve as long as you farm constantly. An entire year's work will earn you 1d10sp. A small house, an outbuilding or two, a vegetable patch, several strips in the fields, and a loud voice in the community. You have 1d6 tenants (total, not families) who live with you and work your land. Income: 12gp/month in a good year, which will exactly cancel out the monthly expenses of a Knight. A rich landowner from the Third Estate might own several large farms and collect their revenues. Note: if you are a Baron, you might own one or more manors. Their revenue doesn't add. You switch to using Baronial revenues at that point. Is that fair or balanced? Nope. But it's way easier to track. A large stone house, several outbuildings, and a great deal of influence. You must be a member of the Second Estate to own a manor. 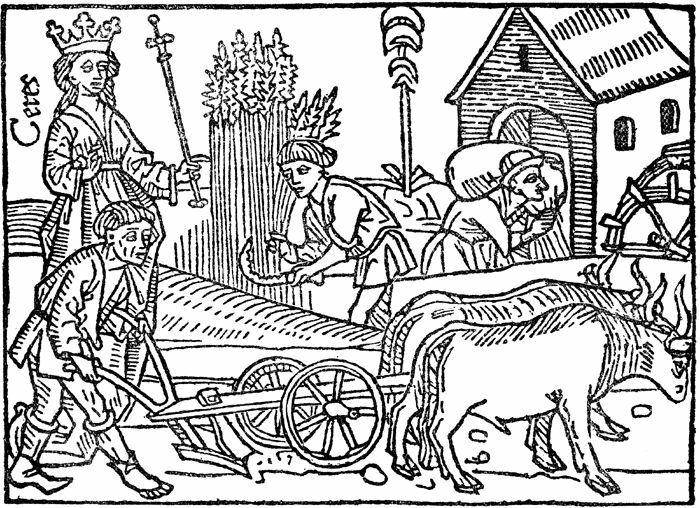 You have 2d6 tenant families (1d4 peasants per family) who live with you, or in buildings nearby, and work your land, plus 2d6 other peasant families who work land of their own and pay you homage. Cost to Buy: 1,000gp plus a baron willing to knight you (usually another 2,000gp in bribes). A very large stone house, probably with a tower. A miniature fortress. You must be a member of the Second Estate to own a manor. You have 2d6 tenant families (1d4 peasants per family) who live with you, or in buildings nearby, and work your land, plus 4d6 other peasant families who work land of their own. If you are very lucky, you might have a village nearby, under your protection. A village adds +10gp per month to your income. The income listed is after the peasants and workers have been paid, ingredients have been bought, etc. It's the profit from your investment. A wooden building with a large sleeping room, a kitchen, and stables. Usually inside a town or city. Comes with 1d4 servants who sleep in the stables or in the kitchen. A wooden-framed shaft or open pit, with a few huts nearby. Comes with 1d4 peasant families (1d4 peasants each) who will mine for you and farm in their spare time. Cost to Buy: You usually can't buy a mine, but you could discover one on land you already own. Will vary by campaign. A village of pixies you can tax. A forest you can cut trees from. A shop. A brothel. A treacle pumpjack. Income: 0.1% of the initially invested value per month. (1000gp = 1gp per month, 12gp per year). PCs want to buy castles, build castles, and decorate castles. It seems like a natural impulse in every group I've seen. Here's how. In disordered times, when Plagues, Wars, and Famine stalk the land, divide all revenue from all sources by 2. In truly chaotic times, divide all revenue from all sources by 10. You can increase your revenue by withholding dues from your lord. These are not taxes, per se. The Second Estate isn't directly taxed, but feudal aids, gifts, ransoms, loans, and other obligations function like a parallel tax system. Can gain an additional 5% of their income by cheating on taxes. Example: Brett the Knight has a Large Farm and earns 12gp per month. He decides to cheat his lord, a baron, and hold back some taxes. He can withold tax and earn and extra 6sp a month.This might not seem like much, but it could be the difference between starvation and prosperity. Can withhold the revenue from any of their hexes that would normally go to the Count. Example: the Barony of Leroux has 2 Undeveloped hexes. 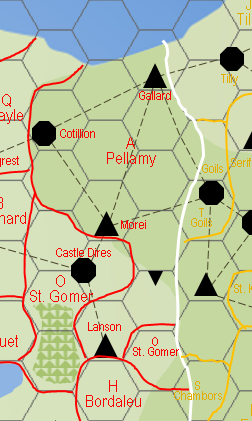 The Count of Pellamy would normally earn 0.5gp per hex. Baron Leroux can instead keep that money, or a portion of it. Some lords with well-audited accounts will notice immediately. Some might not notice for decades. The landowner can plead a thousand excuses from plagues to wars to simple bankruptcy, and depending on the leniency of their lord, the excuses might be accepted.